Learning Experience Rocktober 8-9 – KNOW YOUR RIGHTS (and how they are limited) | AMERICAN HISTORY RULES! ← The 2000 Presidential Election – what a ride! You have two handouts to use for next class – The Bill of Rights Intro and The Bill of Rights Notes. Read “The Story of the Bill of Rights” (on your handout) and then dig into the First Amendment as you take a look at this intro video. Once you are done with the “Five Freedoms”, browse these First Amendment sites below a little and try to come up with a questionable scenario for the freedoms. It makes it a whole lot more enjoyable if you come up with situations that apply to you and your family! Talk to your parents about it! 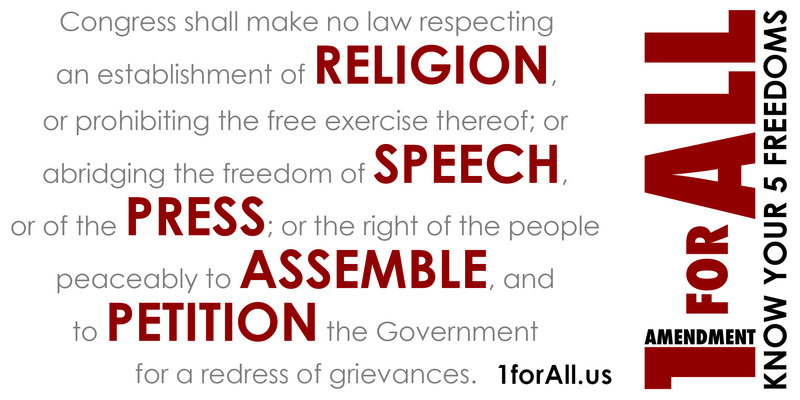 The Five Freedoms from First Amendment Schools – we will use many of these in class! What are your rights in school? Check out First Amendment Schools! Do you know your stuff? Take the First Amendment quiz!